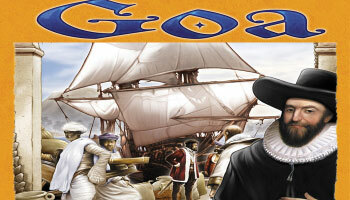 Goa a strategy board game of auctions and resource management set on the island Goa off the west coast of India. Portugal established here a secure seaport from which they could control sea trade, but still the Portuguese did not really have a strong position. The players take the roles of Portuguese merchants involved in the spice trade over the trade route from Portugal to India and back. Each of the players tries to grow his business as fast as possible in the areas of building ships, harvests, taxes, expeditions, founding colonies, and developing colonies in order to score victory points. Each turn begins with an auction phase followed by 3 actions to improve their technologies, fleet or production. The player who have the most victory points by the end of the game is the winner.